Enjoy a Victoria Clipper high-speed passenger-only ferry from Seattle to Victoria, British Columbia! The Victoria Clipper offers great onboard amenities on a less than three-hour cruise through Puget Sound direct to downtown Victoria’s Inner Harbour. Upon arrival, you’ll be steps from Clipper’s hotel partners and fun tours in the heart of Victoria. Skip the hassle of driving with Clipper’s simple and easy downtown-to-downtown service! 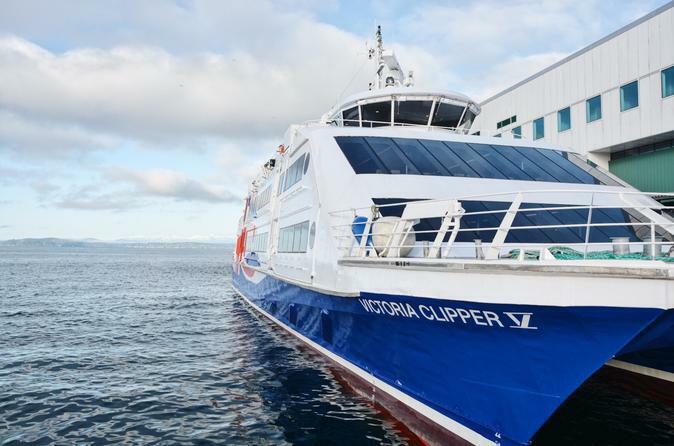 Walk on our high-speed Victoria Clipper catamaran for a scenic ride from downtown Seattle’s Pier 69 to the heart of downtown Victoria. Relax on the less than three-hour cruise through Puget Sound into the Strait of Juan De Fuca. Wide, roomy and comfortable seats provide ample leg room, making your trip easy and relaxing. Enjoy on board amenities such as duty-free shopping for gifts, luxuries and souvenirs and in-seat food and beverage service. The Victoria Clipper docks in Victoria's Inner Harbor - right in the heart of downtown Victoria. This convenient docking area gives you the freedom to start exploring Victoria on your own the minute your step off the boat.